"We all have our own mountains to climb. 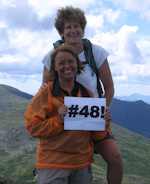 They may be four thousand footers in the White Mountains, but they may be bringing up children, or caring for aging parents. They may be going to school, tackling a difficult project, dealing with an illness, or searching for your passion in life. This presentation is not a presentation of "look at us, look what we did." It is a presentation of "look inside you, you can do this too." "The best thing I've done for myself lately was to attend your presentation." "Your presentation led me to tears, laughter and a new sense of strength and determination to fulfill some dreams." 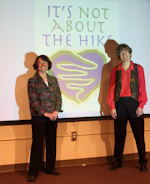 It's Not About the Hike presentation is for EVERYONE -- hikers and non-hikers, people who are sedentary or active, outdoor enthusiasts and indoor homebodies, 10 year olds and 90 year olds and everyone in between. 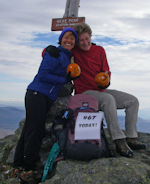 The presentation is not about the hike; it is an inspirational and motivational program about pushing ourselves outside of our comfort zones, overcoming our own fears, finding our passions and living our lives to the fullest. The hour-long program is a multi-media presentation including movies, music and photographs. It is both humorous and touching, as the speakers share from their hearts about their personal lives in a way that makes the message and learning universal.